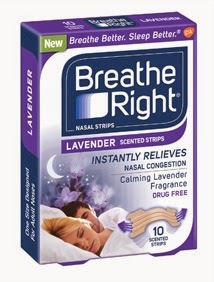 I started using Breathe Right Nasal Strips 4 days ago and have really enjoyed them. The light Lavender scent is just enough it helps me fall asleep more quickly. The ability to breath is probably the best side effect ;) They were easy to apply and surprisingly didn't feel like I was ripping off a bandaid when the time came to remove it.lol I have to say after years of not picking up a box of Breathe Right Nasal Strips I really wish I would have tried them sooner. To have a natural, medication fee way to relieve my nasal Congestion and help with my snoring problems has been really nice. I can't wait to try the kids version on my children when they are in need. I have always wanted to try these to use for when allergies are acting up. This would give me a chance to test them out before I bought them.